Prototype: Atchison, Topeka & Santa Fe Railway (A.T. & S.F.) "Mikado" 2-8-2 design fast freight locomotive. Model: The locomotive has a digital decoder and extensive sound functions. It also has a controlled, powerful motor. 4 axles powered. Traction tires. A 72270 smoke generator can be installed in the locomotive. The headlight and the smoke generator contact will work in conventional operation and can be controlled digitally. Maintenance-free LEDs are used for the lighting. The locomotive has steam locomotive sounds synchronized with the speed, a whistle sound, bell sound, and acceleration and braking delay that can be controlled digitally. A non-working knuckle coupler is mounted on the pilot of the locomotive. There is a close coupling between the locomotive and tender. The locomotive has separately applied metal grab irons. It also has many separately applied details. A figure of a locomotive engineer and a fireman are included with the locomotive. Minimum radius for operation is 360 mm / 14-3/16". Length over the couplers 29 cm / 11-7/16". Highlights: Extensive sound functions. Improved locomotive/tender spacing. 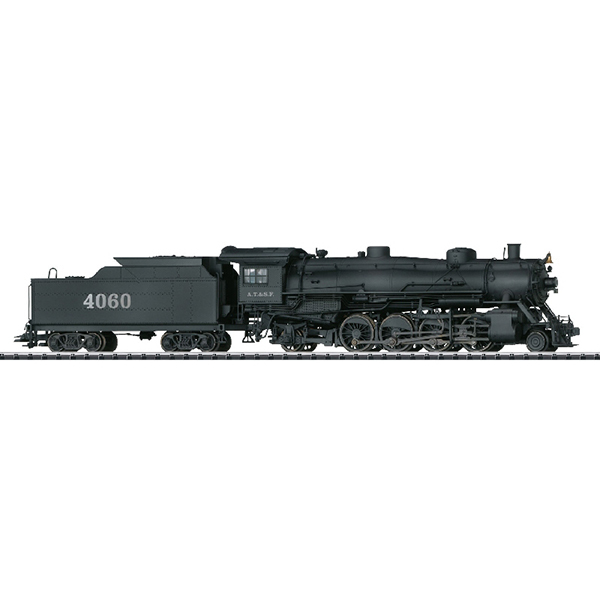 An AC model of this locomotive can be found in the Marklin H0 assortment under item number 37935.